Build from high quality ABS plastic and patented steel ring retention clip design. Our hubcaps offer the best wheel gripping action and superior resistance than any other OEM (Original equipment manufacturer) or aftermarket hubcaps on the market. Our hubcaps are painted with triple coated metallic finish. You get the same quality and durability at 1/4 the price or less compared to OEM parts. It's made to match the original equipment quality but with a much improved design. It is an easy DIY replacement upgrade. 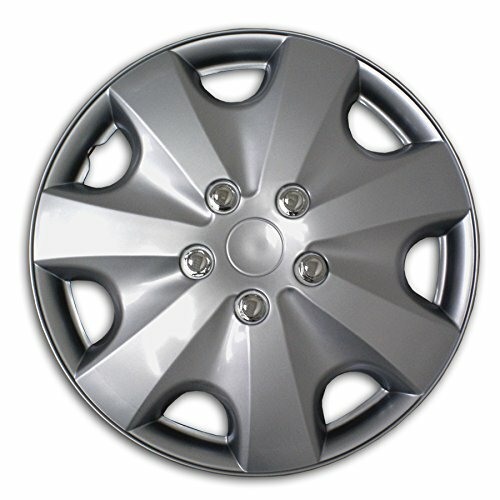 Our hubcaps are great for replacing lost, damaged, or missing hubcap on your vehicles. It's a great way to save money, improve your vehicle's overall appearance, and protecting your factory steel wheel. Installation is a simple process. With our steel ring retention clips, it is a quick snap to install system. For easy cleaning, just use regular automotive soap or water. They are also car wash safe! 1) All tire have a "tire size series" printed on sidewall, which can show you the tire size correctly. 3) Tire size need to match the hubcap size for correct fitment. 4) The vechicle need to has steel wheels and using hubcaps. If you have any questions about this product by TuningPros, contact us by completing and submitting the form below. If you are looking for a specif part number, please include it with your message.